The much awaited soccer season is here! Whether you are a proud parent whose son made the list for the soccer team or a coach who wanted to show your support to your team, a soccer flag will make a beautiful gift. Are you tired of the conventional flag that you used to see every soccer season? Why not try the Teardrop Flag? The Teardrop Flag is suitable for indoor and outdoor events. 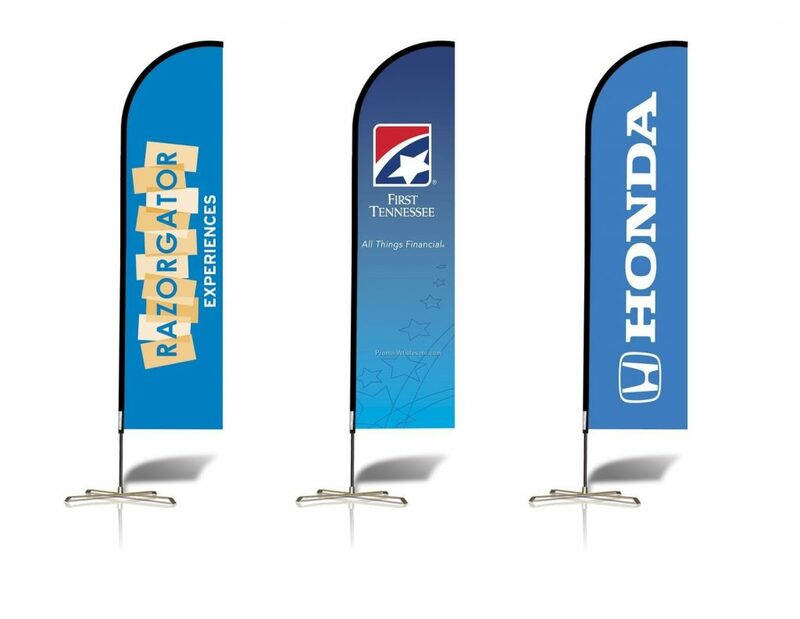 It is a very good way to advertise the team logo and name or if you have a message for the team, you can also send your message using the teardrop flag. The flag uses heavy duty polyester material that is proven to be scratch resistant and fully washable. If you are thinking of including hardware to make your flag heavy-duty, you can also find everything you need in the team sport banners website. Currently, the site has 57 unique and colourful designs that you can choose from. All of them are kid-friendly and good for all generation. If you have some ideas in mind and wanting to create your own design, that is possible too. Just simply upload your design in the order form and our high-calibre graphic artist will do it for you. As we strive to achieve our mission, each month Sporting Generosity will identify an individual that has meant more to the sports world than his or her achievements on the court, ice, or field. This individual will have given back to the community by providing hope to a sick child, financial assistance to an underprivileged youth, or by becoming an advocate for a specific cause. These athletes are people who give back not out of obligation, but out of conviction in its necessity. With that said, please congratulate our September, 2011 Player of the Month. Paul Rabil, born December 14, 1985, has been deemed by many loyal fans as “the LeBron James of lacrosse.” Since being drafted out of Johns Hopkins University in the first round of the 2008 MLL (Major League Lacrosse) draft, Rabil has been the face of the Lacrosse. Rabil currently plays for two professional teams, the Boston Cannons in the MLL and the Washington Stealth in the NLL (National Lacrosse League). His work ethic is unparalleled and the results are unrivaled. On the field honors include, but are not limited to, the MLL MVP in 2009 & 2011, MLL Offensive Player of the Year 2009 & 2011, 2010 Winner of the NLL Champion’s Cup (Washington Stealth), 2010 World Lacrosse Championship MVP with Team USA, and 2011 MLL Steinfeld Cup Champion (Boston Cannons). Rabil also currently holds the world record in the Fastest Shot competition with his shot clocking in at a “measly” 111mph. But like all Sporting Generosity honorees, Rabil is exceptionally making his mark in the world of philanthropy. 2011 has proven to be an exceptionally busy year off the field. In August, with the help of close friends and family, he founded and launched the Paul Rabil Foundation. It’s mission is to “build awareness and destigmatize learning differences through the avenue of sports and scholarships,” said Rabil. The mission of his foundation holds a personal connection as Rabil himself (as well as his brother), has grown up with a condition called Auditory Processing Disorder. APD is an umbrella term for a variety of disorders that affect the way the brain processes auditory information. Individuals with APD cannot process the information they hear in the same way others do, which leads to difficulties in recognizing and interpreting sounds. APD presents everyday challenges and Rabil fully understands the impact these have on the lives of those who have the disorder. The Paul Rabil Foundation is teaming up with The Lab School, which is a K-12 coeducational day school for students with learning disabilities. Also attended by his sister who suffers from dyslexia, Rabil is pledging to begin annual grant scholarships to the school in hopes of advocating for early learning, support, and awareness for children who suffer from dyslexia. Rabil, with the help of Warrior Lacrosse (one of Rabil’s sponsors), also aims to create the Lab School’s first ever fully functional Lacrosse program. To learn more about the Paul Rabil Foundation please click here. As we strive to achieve our mission, each month Sporting Generosity will identify an individual that has meant more to the sports world than his or her achievements on the court or field. This individual will have given back to the community by providing hope to a sick child, financial assistance to an underprivileged youth, or by becoming an advocate for a specific cause. These athletes are people who give back not out of obligation, but out of conviction in its necessity. With that said, please congratulate the November 2010 SG Player of the Month. Boris Babacar Diaw-Riffiod, better known as Boris Diaw, was born on April 16, 1982 in Cormeilles, France. Boris began his career with the Atlanta Hawks in 2003, however a trade to the Phoenix Suns is what supplanted him as an up and coming star in the NBA. At the conclusion of the 2006 NBA season, Boris was named the Most Improved Player in the National Basketball Association after averaging 13 points, 7 rebounds, 6 assists, and a block on 53% shooting from the floor. He was traded to the Charlotte Bobcats in December 2008 and helped lead them to the franchise’s first ever playoff birth in the 2009-2010 basketball season. In 2005, Boris, his family and close friends created the Babac’Ards foundation. The name of the association is a play on words between Boris’ second name of Senegalese origin (Babacar) and a meaningful set of initials representing the Association for Realization in Development and Solidarity. The foundation’s mission is to improve the lives of children in Senegal by facilitating educational development and recreational programming. “Combining sport and studies is the way to success for Senegalese future athletes,” said Julie Lingy, president of the foundation. To achieve its mission, Boris and the Babac’Ards Foundation launched a series of camps known as the Diawthentik (pronounced D-Authentique) camps. The camps include both physical and mental enrichment activities relating to basketball and life skills. Commencing in 2006 and continuing today, the foundation has financed and administered approximately 15 camps which have benefited nearly 1,500 Senegalese children, as well as the coaches and instructors who will help these children implement their skills. In addition to camp programming Babac’Ards has provided funding for a local orphanage, and scholar books to Senegalese schools. Medical supplies, toys, DVDs, books, and more have also been provided to the Le Dantec hospital in Dakar to distribute to children suffering from cancer. In South America, Babac’Ards has entered into a partnership with the President of the Peruvian Basketball Federation to provide funding and assistance for the implementation of eight basketball academies for “at-risk” children. Finally, Boris and Babac’Ards is currently in the process of setting up a training center for young women in the Thies region of Senegal. With an emphasis on basketball, the training facility will create social, educational, and athletic programming for young women between the ages of 13-18. The objective of the facility is to open doors to young women not only in sports related fields but to improve their education and standing within society. For more information on the great work done by Boris and his foundation, please click here.